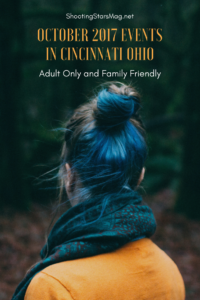 I live in the Cincinnati, Ohio area and we have tons of fun events and activities that go on all year round. I’m a big fan of all the things that occur in the fall and for Halloween. Therefore, I thought I’d share some October 2017 events for those who live around me! If you live elsewhere, maybe these ideas will entice you to look up your own state or city and see what is going on! Date night, girl’s night out, whatever you want it to be – here are some fun events coming up this month that are more adult than family-friendly! What sounds good? Do you have any adult-only events near you? Thursday, October 12th 5 to 8 p.m.
Saturday October 14th 5.30 to 11 p.m.
Friday, October 20th: 7.30 – 9 p.m.
Saturday, October 21 7-11 p.m.
Wednesday, October 25th 5.30-8.30 p.m.
Now here are some fun events and activities that are suitable for a family – so bring your kids along! Interested in any of these? Does your city have anything like this? Saturday and Sunday October 7th and 8th 10 a.m. to 6 p.m.
Sunday, October 8th 10 a.m. – 4 p.m.
Sunday October 8th 2-3 p.m.
DEALS: Kids Free Weekend, October 7th and 8th ONLY. Buy one general admission ticket ($12) and get a free child admission (10 and under). Saturdays and Sundays in October – noon to 5 p.m.
H.H. – Friday and Saturday 6 p.m. – 1 a.m.
GPF – Saturday and Sunday 11 a.m. – 7 p.m.
Friday, October 13th at 8 p.m.
Saturday, October 28th 10 a.m.-4 p.m.
Saturday and Sunday October 28th and 29th 12-6 p.m.
WOW! You have a ton of fun events around your area! I wish we had that much stuff going on here in MN! Then again, we might and I might just not know about it, I should check into it. So many fun things! That sunflower fest sounds awesome. And all the free Halloween movies?! So much fun! I think you could go to something every day in October and not run out of new things. Great list! Great recap! Makes me wish I was planning a trip to Cincinnati this fall. Definitely lots to do. I live in Portland and we always have tons to do here. That is a benefit of the big city. I was there last October and remember how much fun stuff they had going on! I wish I lived there so I could attend the Zombie Ball. It sounds amazing and unforgettable. I’ve probably already mentioned this before, but you are super lucky with all the events that happen near where you live! I wish we had as much, I’d definitely be up for a murder mystery dinner! Thanks for sharing! These events sound like so much fun! Wow! So many fun events to choose from! I hope you get to attend a bunch of them! Lots of cool stuff in your area! I always thought a murder mystery dinner would be a lot of fun . And a Zombie Ball? I would so go to that lol. The fiery food expo sounds cool too- I love spicy food, if that’s what it’s about. I love Murder Mystery Dinners! That fiery foods expo sounds fun as does the ladies antique mall thing!!! I need to plan some fall activities!